It’s a much anticipated document and it can be found in the agenda for Monday night’s city council meeting. We are referring to the city’s consolidated financial statements for 2015 which include details of its investment in Ascent Group Inc.
Not sure whether it is meant to offer reassurance to ratepayers, however that portion of the document opens with “The city owns 100% of Ascent Group Inc. which in turn owns 100% of St. Thomas Energy Inc., Ascent Energy Services Inc., Ascent Solutions Inc., Ascent Utility Services Inc., and Ascent Renewables. Once you digest the Ascent Group financial statement we, as ratepayers, would be better off owning a fleet of wheezing Russian Ladas. It’s proving to be a hand-to-mouth existence for St. Thomas Cemetery Company after it came up $9,000 short in funding from the city this year. The board of directors had originally requested a $59,000 operating grant but on Monday received $20,000, to go with an initial instalment of $30,000 in April. This money is applied to the board’s almost $200,000 operating budget. The municipality began funding the company in the mid-1980s to avoid a takeover. Council voted 7-1 — with Coun. Mark Tinlin in opposition — to support the cemetery board through reduced levels of funding over time. Council could also consider advancing funds for minor capital replacements and expansion in services if other financial resources are not available at the time. It’s shaping up as a hand-to-mouth existence for St. Thomas Cemetery Company. City council Monday voted to extend the cemetery board of directors a financial life line of sorts by way of a $20,000 operating grant. Combined with the first instalment in April of $30,000, it leaves them $9,000 short of the amount requested during this year’s budget deliberations. The cards were laid on the table Wednesday at a special reference committee meeting of city council held at the Seniors Centre. After a summer of deliberation, the steering committee struck by council on April 20 to develop a business plan “that reflects the ability of St. Thomas Cemetery Company to be sustainable” delivered the goods. And it wasn’t music to the ears of Mayor Heather Jackson and most councillors. 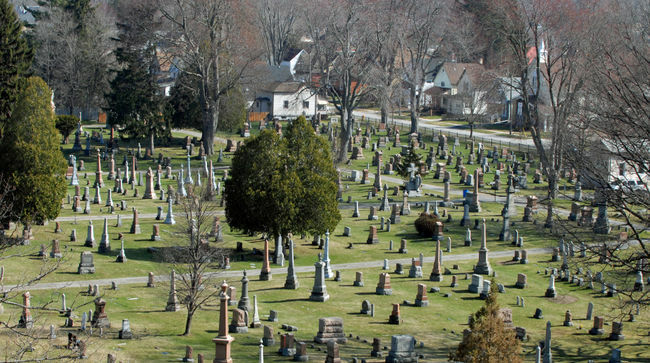 “There are only two options,” advised cemetery board member and former alderman Gord Campbell. As referenced in this corner last week, city council will be in receipt Monday of a report outlining the tender results for construction of the new St. Thomas Police Service headquarters. The low bid is $10,733,000 from M.J. Dixon Construction, a Brampton firm. That figure includes construction of the one-storey facility just west of the Timken Centre and the T-intersection at the north end of Third Ave.
Eleven firms were pre-qualified for the process and nine of those firms submitted bids. What’s it like living next door to a disaster? She lives in a well-maintained, tree-shaded 1890’s-era house on Kains St. Pride of ownership includes custom stain glass windows inside, one of which once graced Alma College. Sounds like an ideal abode to retreat to. Not quite, cautions owner Pauline Wimbush. She is referring to the abandoned and derelict cottage-style house at 46 Kains St.
A quaint residence that, in its prime, no doubt could have been described as picture postcard perfect.